August is here and it’s passing by in a flash! 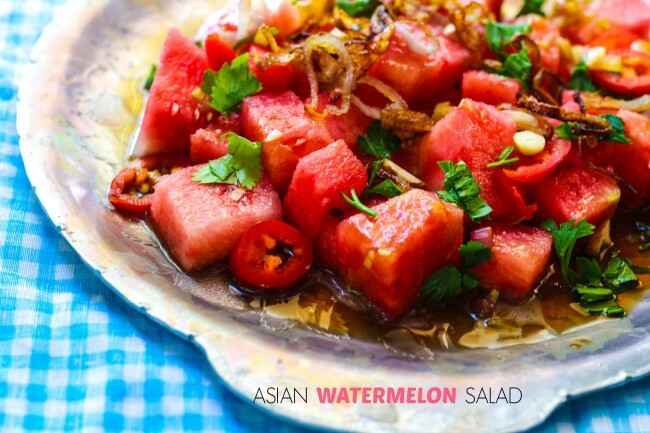 Which means summer is almost over (yes, I’m sobbing silently)which means what better time than now to share a fabulous Asian watermelon salad! I’ve recently been looking for more fresh and easy summer recipes. I am used to eating watermelon in all of its sweet and glorious natural sweetness. After just coming back from Italy and enjoying watermelon at the end of every meal, I wasn’t sure if I could explore using it in a recipe. But with another Blogger’s Clue Society event upon us and it means a new fun event! I recently had the chance to go on a sort of scavenger hunt on a blog I’m not very familiar with. Why was I inspired to make a watermelon salad what does it have to do with blogger C.L.U.E? The hunt was for a group I belong to called blogger C.L.U.E. and the blog I was given to search through was Kate from Kate’s Kitchen. Kate is a financial planner that lives in Indiana and she “lives to cook”. If you have a chance to check out her blog, you will see that is so true! Kate shares stories and great recipes every week! I had fun perusing through Kate’s blog with our theme Beat the Heat. I was leaning towards making her bruschetta with cantaloupe chutney and her chile lime watermelon salad. 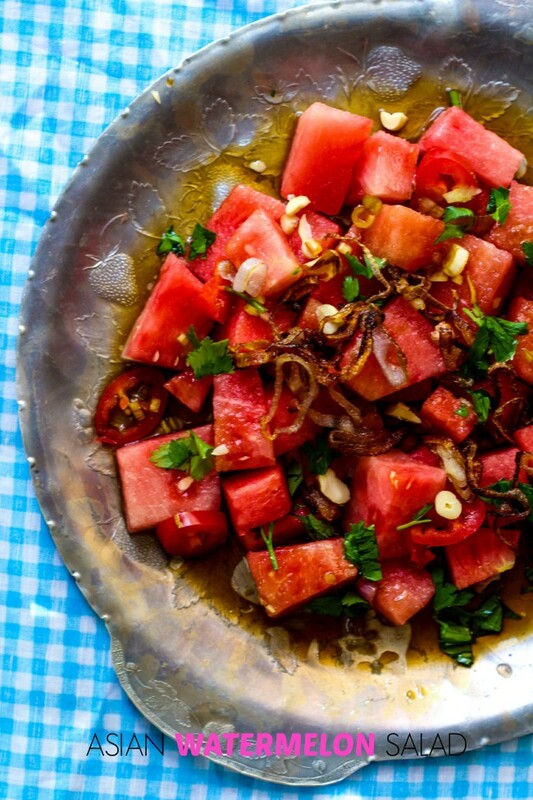 and instead was inspired by her Thai watermelon salad. 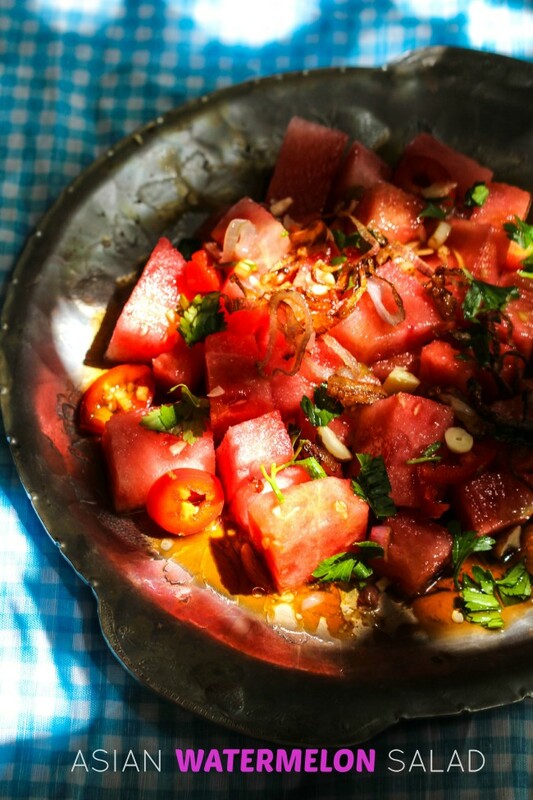 The Thai watermelon salad was a Jamie Oliver recipe and I ended up adapting it with a recipe I found in a Food Network magazine from last summer. The recipes were pretty similar!! I am always interested in solving a good mystery, so it was only natural that I would be loving this food blogging group: blogger C.L.U.E! Today is reveal day, and this month’s theme is: Beat the Heat!! Join me in reading about the food hunted down this month in the #bloggerCLUE member’s kitchens! Heat the peanut oil in a small saucepan over medium-high heat until a deep-fry thermometer registers 350 degrees F.
Add the sliced shallot and cook (make sure you reserve the other portion for your dressing), stirring often, until golden brown, about 3 minutes. Remove with a slotted spoon and drain on paper towels; season with salt. Whisk 2 tablespoons of the frying oil, the chopped shallot, lime juice, fish sauce, soy sauce, garlic, ginger and jalapeno in a large bowl. Add the watermelon and toss to combine. Add the cilantro, basil, mint and 2 tablespoons peanuts to the salad and season with salt; toss to combine. Top salad with chopped peanuts and fried shallot.